Lily Gladstone as Jamie, a painfully lonely ranch manager. 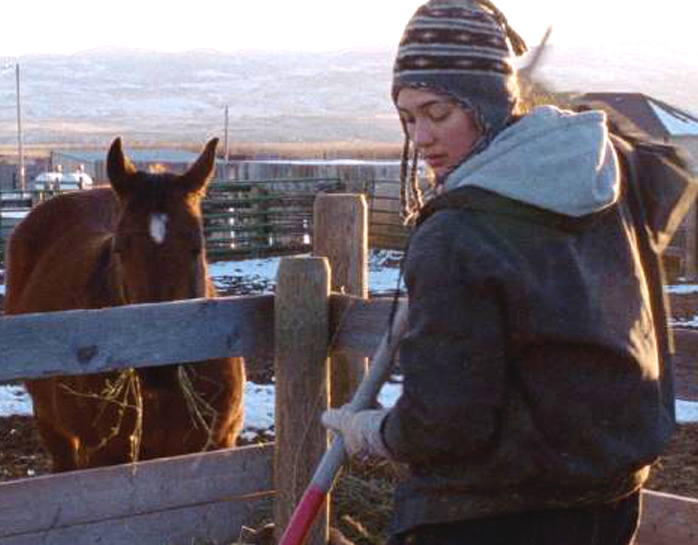 Contributed by Jonathan Stevenson / Kelly Reichardt’s unostentatiously virtuosic Certain Women, based on Maile Meloy’s short stories, depicts hardscrabble Montana in angular austerity, with the simple lines of mountains and fences and utilitarian buildings, in the subdued colors of impending snow, through iterations of circumstances that illuminate foibles and strengths. Natural spectacle may not be lost on her characters – in the main stoically persevering women far removed from anyone who might indulge a preoccupation with upward mobility – but it is beside the point as they struggle against physical isolation, emotional confinement, and social and professional subordination to find a little spiritual satisfaction. So Certain Women qualifies as a contemporary revisionist western, its main characteristics being determination and limitation rather than heroism and expansiveness. Laura (Laura Dern), a Billings lawyer, doggedly represents a sometimes ungrateful carpenter rendered desperate by an occupational injury that has left him unable to work. Local housewife Gina (Michelle Williams) compensates for a distant husband and a petulant teenage daughter with the construction of a customized new house from the ground up, using only “authentic” materials. Recent law graduate Beth (Kristen Stewart) works at a marginal Billings firm and undertakes an eight-hour commute to a range town where she teaches an employment law course to a handful of dispirited adult students. The one appreciative one is Jamie (Lily Gladstone), a ranch hand whose only friends are a few horses and an energetic corgi. She becomes infatuated with Beth, but is ultimately disappointed. The acting is uniformly fine, the biggest revelation coming from newcomer Gladstone’s achingly woebegone performance. Delicately but assuredly linking Meloy’s stories in three vignettes, Reichardt revisits her standing theme of endeavor with scarce resources, here with a sense that life even for decent people is often zero-sum. In their attempts to cope, her women do impose costs. Laura sleeps with a married man. Gina importunes an elderly friend to provide her with sandstone for her house that he is reluctant to relinquish. Beth, in her dissolute state, leads Jamie on, though Jamie herself puts Beth on the spot. In extending Certain Women the Best Film award at the BFI London Film Festival, the official jury cited “the isolation, frustrations and loneliness of lives unlived” as the subjects of the film. But the shortfalls in fulfillment Reichardt’s women experience do not constitute tragedy given that, for her, effort alone is certainly living. A women’s existential frustration is no more an indication of a life “unlived” to Reichardt than a woman’s physical imperfection was one of human inadequacy to Alice Neel. When Gina beholds her new house being built, exhales the smoke of a freshly lit cigarette, and smiles tentatively, she resonates not forlornness but, however small and constrained, accomplishment. Certain Women, 2016, written and directed by Kelly Reichardt. Released by IFC Films, premiered at the 2016 Sundance Film Festival.